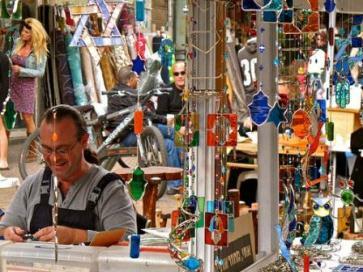 Wondering what to do if you have just one day in TelAviv? On a warm sunny Friday after a storm, my friend Nathalie and I decided to enjoy Tel Aviv. Since we were taking my two kids along, we wanted fun things to do for adults and children alike. 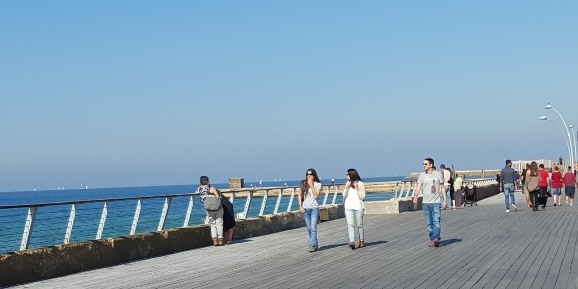 The ideal first stop in Tel Aviv is always the beautiful seaside promenade. The different sections of the 'tayelet' as its called by the natives overlooks the sixteen beaches along Tel Aviv's western facing coastline. Each Tel Aviv beach has a somewhat different character but they are all breathtaking. 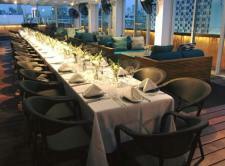 We chose to meet on the wooden decks of the Tel Aviv Port. The port is buzzing night and day, but I especially love its tranquility in the early morning hours. 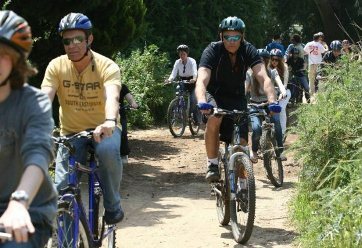 While we walked along the port and enjoyed the salty sea breeze and the view, my son Gilad joined the joggers and bikers and had fun cycling around. 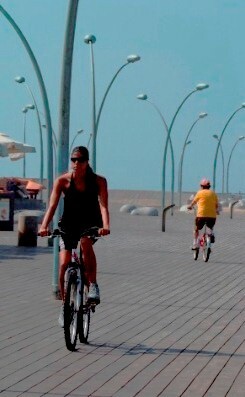 Biking around Tel Aviv is a great way to explore the city. You can rent a bike with Tel Aviv's convenient and cheap bike share program with bikes conveniently located all over the main tourist areas. Or you can choose to take a guided bike tour of the city. It's a unique way to see the ins and outs of Tel Aviv up close and personal, especially if your time is limited. A visit to Tel Aviv is not complete without a classic Israel-style breafast. Israeli breakfasts are not just uniquely different than anywhere else in the world, they are really quite tasty! 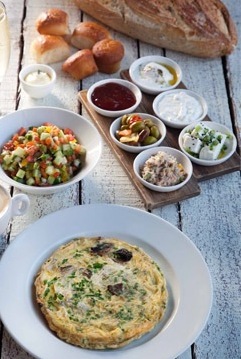 TelAviv port is full of restaurants serving Israeli-style breakfasts. We stopped at Yulia, a good seafood restaurant that serves a classic Israeli breakfast. Which means what? Crisp, freshly baked bread, a variety of local cheeses, an omelette with fresh herbs and onions, "Arab-style" tomato and cucumber salad, small platters of olives, homemade jam.. and my favorite, ‘labne’ – a tangy yoghurt spread topped with ‘zatar’ (hyssop) and drizzled with olive oil. 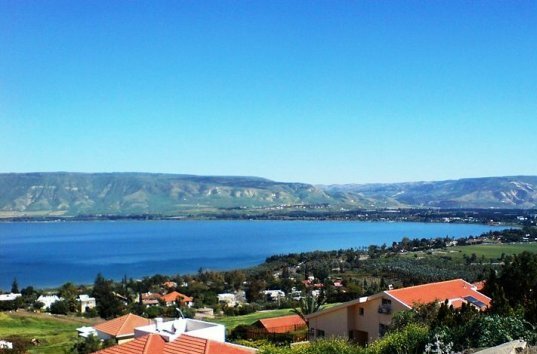 After the seaside, our next recommended spot is to soak up some Israeli culture. What are the options? The Israel Art scene is lively, with galleries and museums galore. I highly recommend it.. but my kids weren't in the mood for art. They wanted to visit the amazing Israel Safari Park, a wonderful Israel zoo, which is just a fifteen minute car ride from the center of Tel Aviv. Besides being a great zoo, they offer guided tours there where you can actually feed the animals and see how the zookeepers care for the animals. We had been to the zoo a few weeks earlier, so I protested! Finally, we compromised. My son Gilad had to prepare for his school genealogy project, so we agreed to visit the Diaspora Museum - the Museum of the Jewish People (Beit Hatfutsot). The fascinating museum chronicles Jewish life around the world over the past 2,600 years. You can also look up the origin of family names and places, which is what Gilad needed to do. Visit our Tel Aviv Museum Guide to select which museum works for you. We debated where to go next. 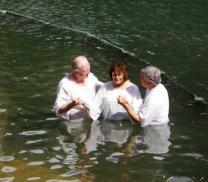 As usual, we were 4 people with 4 different opinions! 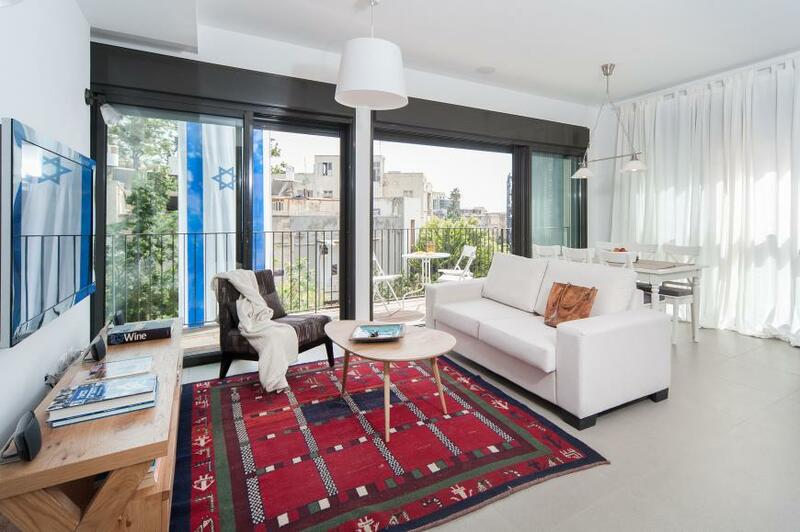 Tel Aviv is a city of distinct neighborhoods, each one having its own special atmosphere. You can learn more about them on our page on Tel Aviv-Yafo streets and neighborhoods. But if you only have time for one distinct area in Tel Aviv, then it has to be Jaffa. Exquisite old Jaffa, Israel in the south of Tel Aviv is a must-see in Tel Aviv. 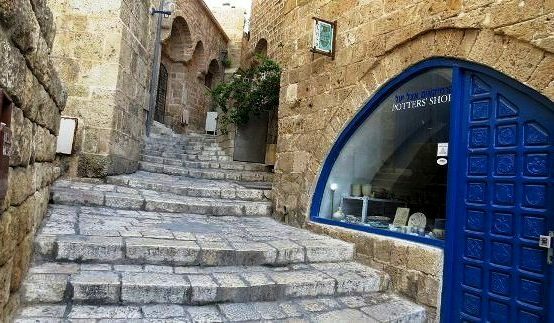 You will love wandering its narrow alleyways, seeing the views and Napoloen's cannon from the Hill of Jaffa, visiting some of the great art galleries and shops, and the renovated Jaffa Port. In southern Tel Aviv just a few minutes walk north of Jaffa is HaTachana - Tel Aviv's old Train Station complex. Every day in the summer, they have kids' activities and street performers. My son Gilad had seen there a great acrobatic show and hoped to catch it again. 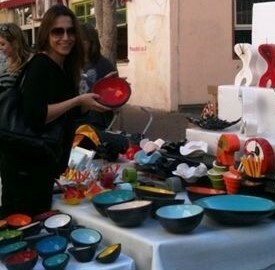 Nathalie adores Tel Aviv Shopping which is amazingly eclectic. We roamed around Carmel Market (Shuk HaCarmel to Israelis), enjoying the sights and smells, while munching on fresh chees burekas that we bought there. We decided to stroll and shop around in colorful Nachalat Binyamin, an outdoors arts and crafts street fair open every Tuesday and Friday. Of course, Eden, my teenage daughter wanted to buy something. There is something here for all ages. Eden chose a funky leather bracelet. Nathalie bought a set of hand painted dolls for her niece. I loved the beautiful hand-blown glass miniatures. The artisan prepared them as we watched. We had fun wandering in between the artists' stands. On the corner of Nachlat Binyamin and the Carmel Market is the Magen David (Star of David) Square. The Square is in the middle of Allenby Street. If you are looking for the authentic Tel Aviv and you have a spare hour, stroll along Allenby Street and discover its elegant, historic buildings amid graffati, chintzy shops, fast food joints and at night, bars and clubs. We were getting tired. It had been a long day. It was Friday afternoon, when most of the shops and places in Israel close down early. 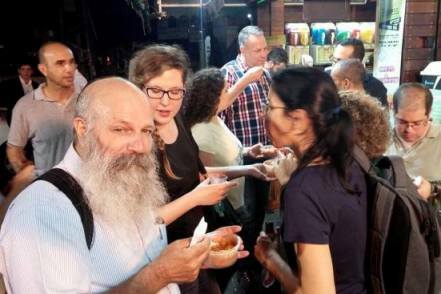 Israeli's tend to go out quite late, and Friday night is 'party night' in Israel. We went home to rest. Later in the evening, like most Israeli families, we would enjoy a traditional Friday night ‘Sabbath’ dinner, this time with my husband’s extended family. But you can choose to have dinner at some of our favorite Tel Aviv restaurants. Or have a drink and a snack and our handpicked list of Tel Aviv bars - each one is completely different than the other. 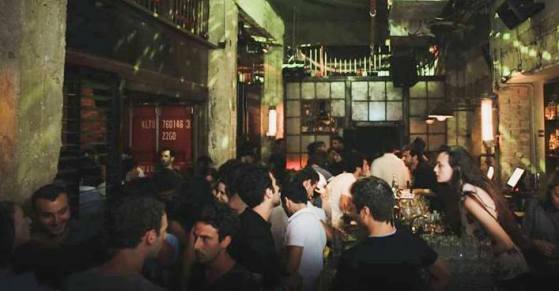 Let’s just say that Tel Aviv Nightlife is second to none with insanely packed clubs and bars all year round. 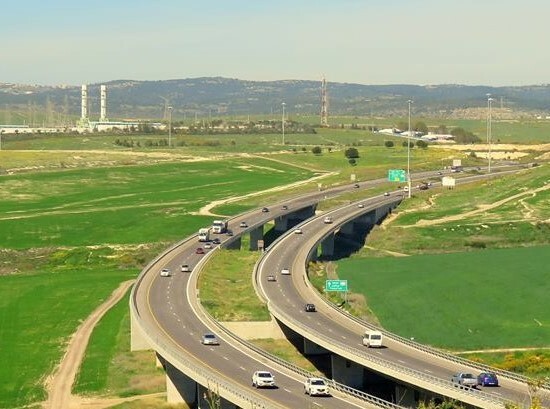 To find out what’s happening this month in TelAviv, make sure to visit our page on Monthly Tel Aviv Events and News from Israel for the most up-to-date local art exhibits, concerts, cultural events and nightlife information. Unlike us natives, you may want to explore TelAviv in a more structured manner. 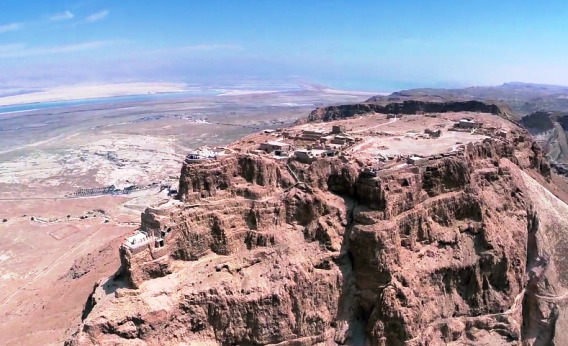 We recommend these three, private Insider Tel Aviv Tours to consider.